Clarabridge is one of a handful of companies that have revolutionized customer experience management, by providing an enterprise-grade technology platform for systematic measurement and improvement of business–consumer relationships. Hence the theme of this year’s Clarabridge Customer Connections (C3) conference: The Customer Experience Revolution. This article is my 2017 conference report. Point #1: Clarabridge practices what they preach. Great customer experience (CX) produces strong relationships, and strong client relationships – along with technology advances – were a centerpiece of this year’s C3. Clarabridge delivered an engaging program that highlighted both long-time customers such as Expedia and Verizon and newer signers such as the New York Times and LoanByPhone.com. 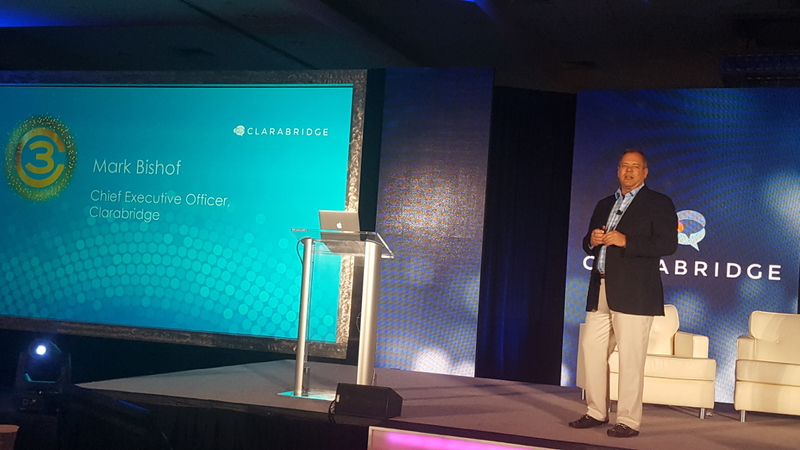 And Clarabridge showcased insights platform progress, in particular extended contact-center data capabilities and further emotion-analytics build-out, addressing an important CX data source and a key source of consumer insight. Past years’ shiny new stuff, for instance the CX Social customer-care solution? Now demoted to routine CX status. C3 opened with keynotes by CEO Mark Bishof and by founder and Vice Chair Sid Banerjee. Noting that Bishof joined the company only in January, I was impressed by his grasp of the evolving nature of corporate–customer interactions and of Clarabridge client needs. He has clearly spent a lot of time with clients; senior staff told me about extensive one-on-one and group product and market discussions. (I spent a lot of time at C3 interrogating Clarabridge clients and staff. There’s no end to what you can learn by asking.) And the acuity of Banerjee’s vision is always impressive. Product VP Fabrice Martin described a bit of platform turn-around that was equally consequential. Martin reported a 97% improvement in data classification speed, gained via refactoring over the last couple of years. The company boasts a figure of 16 billion documents processed to date. I know that performance bottlenecks had been a concern and created on-boarding difficulty, prior to the reengineering effort. Another advance: Clarabridge is implementing newer natural-language processing (NLP) functions and new language support via machine learning. It’s both blessing and burden that you can tune Clarabridge’s legacy rules-based NLP, beyond its out-of-the-box industry and business-function adaptation. You tune by coding syntactic patterns and modifying company-supplied taxonomies. This approach can mean significant investment and upkeep and deliver limited recall, that is, ability to identify information that hasn’t been coded. Machine learning enables a leap forward. Point #2: Clarabridge text analytics capabilities continue to distinguish the company from the CX competition, whose own or third-party NLP capabilities generally lag Clarabridge’s. I’ll call out seven additional capability points, in the three sections that follow. Two points reflect strategics bets. The third is the normalization of social and the fourth the extension of Clarabridge language coverage. The fifth, image analysis, is an absence rather than an advance, and the sixth and seventh, emotion analysis and smarter surveys, represent innovation. Last year’s C3 was the first to showcase Clarabridge’s partnership with voice-data platform Voci. This year, it seemed like half my C3 conversations concerned speech analysis and speech-to-text transcription. Some conversations focused on contact center recordings and customer-service and CX use cases; some were about compliance in regulated industries including finance and telecom. CEO Mark Bishof offered a stat in his keynote, that only 2% of customer feedback is offered via surveys, while 90% of customer interactions flow through the contact center. Add the contention that agent notes don’t reliably reflect the full extent of customer concerns and sentiment and you have an imperative to look to call recordings for sought-after voice-of-the-customer insights. Mike Cholak from consultancy Convergys commented that call center analysis has been about efficiency, about customer-service costs. His company’s aim, partnering with Clarabridge, is to find opportunity by expanding analyses from support transactions to customer-service journey insights. For Clarabridge, I’d characterize both the speech/contact-center focus and related case-management capabilities as strategic bets. The Clarabridge differentiator is captured in “based on structured and unstructured data.” Traditional contact-center case management and “workforce optimization” rely exclusive on numerical metrics – first-call resolution, number of calls to resolve, mean call time, and so on – which neglects the attitudinal and explanatory information captured in call recordings. One change from last year’s C3: Less prominence for social engagement solutions, more a normalization of social within the spectrum of customer interaction points than a deemphasis of social. Social is still big. One of the more interesting C3 presentations was by Adam Lamb of the Restaurant Group, who spoke on Exceeding Expectations Using [Social] Engagement. Adam and team have built a social-response strategy that both turns around negative restaurant experiences and converts positive experiences into positive brand relationships. OK, acknowledging that I’m using a lot of industry jargon here: The Restaurant Group uses social engagement to refocus the brand value proposition from strictly food to an overall brand experience, from a product to a relationship. This is savvy CX. Finally, a C3 absence: Image analysis. If your (or a competitor’s) brand or product is captured in an online or social image, wouldn’t you want to know? You can learn a lot from images: How customers use your products, the mood and emotions they invoke. Step 1 is to detect brand marks in social-posted photos – “visual listening.” Clarabridge had announced a partnership with Ditto Labs, present at 2016’s C3, for this capability, but Ditto didn’t attend this year’s C3 and I recall no mention of image analysis. Perhaps customer uptake hasn’t met expectations? 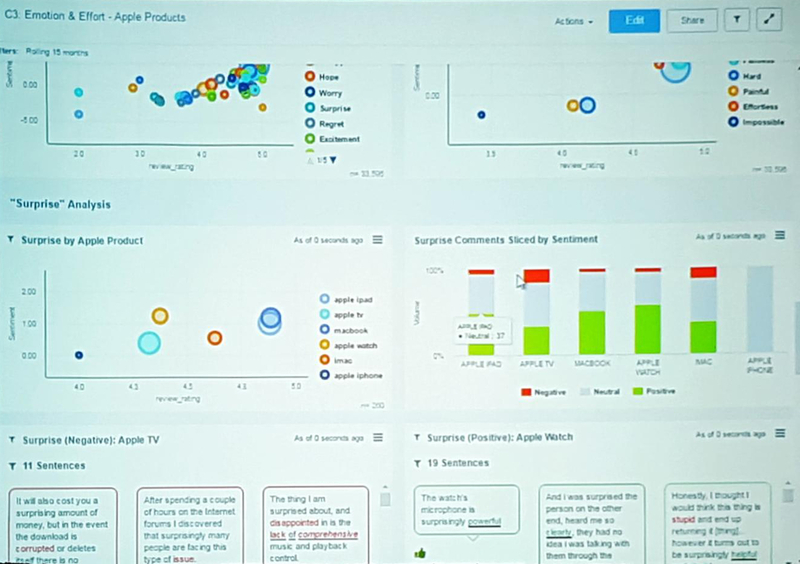 Clarabridge launched emotion analytics at 2016’s C3. 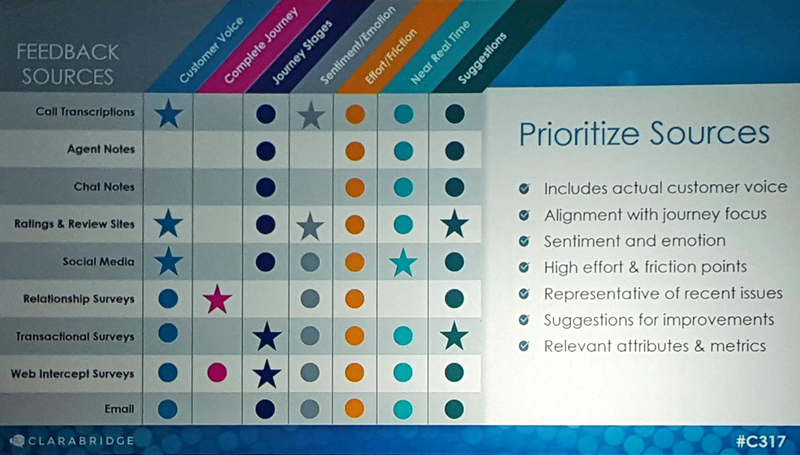 This year, the topic generated so much interest that product manager Ellen Falci’s Going Beyond Sentiment: How to use Emotion and Effort in your CX Programs was moved to a larger room. Falci’s linking of emotion and effort was interesting and astute, the thought that “points of high friction and confusion” in the customer journey may merit special attention, depending on their impact. Falci spoke about a basic two-tier effort model, set for summer launch, complementing the more extensive two-tier emotion model that launched last summer. Linked emotion and effort analyses enable design of an “empathetic solution,” according to Falci. But I don’t recall any C3 customer presentations applying emotion analytics, effort-linked or not. I take it that capabilities are in controlled roll-out. Survey innovation is the final C3 point I’ll cover, a response to declining survey-response rates and high abandonment rates. Clarabridge’s refocus on contact center is an answer to declining response. And abandonment? Branching logic is one answer to abandonment, in effect, support for complex question paths that keep the survey relevant for a given respondent. But Clarabridge product VP Fabrice Martin noted that you can’t anticipate every customer concern. You may not know what to ask, so hard-coded survey logic isn’t a final answer. Clarabridge is rolling out AI conversational surveys. It’s a new survey engine, highly branded, mobile first, powered by an AI bot that monitors responses and tailors follow-up. (Clarabridge acquired Market Metrix in 2014 in a first foray into surveys.) The new bot applies NLP to rate sentiment, discern topics, and allow follow-on detail questions on topics detected. The product is in beta, slated to be available this summer, an interesting development! Clarabridge has a bright future. The company has addressed past performance issues, solidified executive management, refocused product development on high value, high payoff needs, reenforced partnerships, and continued to enhance its market-leading technology. The real proof, however, is in a line I used to open this article. Great customer experience produces strong relationships, and strong client relationships were a centerpiece of this year’s C3. If we do see a CX Revolution, Clarabridge is sure to be on the front lines.